Further details about the book are available here. 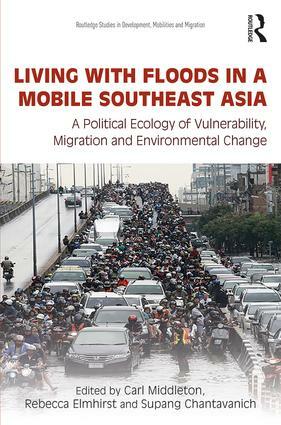 Open access copy of Chapter 1 of the book can be downloaded here: "Migration and Floods in Southeast Asia"
Further details about the project "Mobile Political Ecologies of Southeast Asia" can be found here, including a policy brief summarizing the project findings here. This book contributes to a better understanding of the relationship between migration, vulnerability, resilience and social justice associated with flooding across diverse environmental, social and policy contexts in Southeast Asia. It challenges simple analyses of flooding as a singular driver of migration, and instead considers the ways in which floods figure in migration-based livelihoods and amongst already mobile populations. The book develops a conceptual framework based on a ‘mobile political ecology’ in which particular attention is paid to the multi-dimensionality, temporalities and geographies of vulnerability. Rather than simply emphasizing the capacities (or lack thereof) of individuals and households, the focus is on identifying factors that instigate, manage and perpetuate vulnerable populations and places: these include the socio-political dynamics of floods, flood hazards and risky environments, migration and migrant-based livelihoods, and the policy environments through which all of these take shape. The book is organised around a series of eight empirical urban and rural case studies from countries in Southeast Asia, where lives are marked by mobility and by floods associated with the region’s monsoonal climate. The concluding chapter synthesizes the insights of the case studies, and suggestions future policy directions. Together, the chapters highlight critical policy questions around the governance of migration, institutionalized disaster response strategies and broader development agendas.